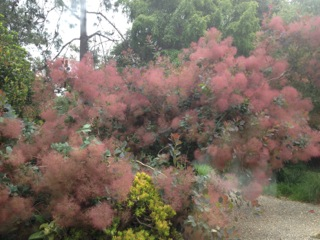 Exploring available varieties can be as much a delight as discovering the numerous virtues of smoke bush. 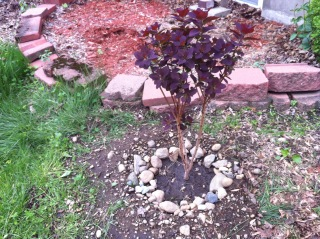 Cotinus coggygria cultivars, ‘Purpureus’ and ‘Nordine Red’ produce leaves that are at first purple then olive green. ‘Velvet Cloak’ and ‘Royal Purple’ are thought to be the same plant, and hold their dark burgundy color throughout the summer months. ‘Pink Champagne’ is a green-leaved variety with pinkish-beige plumes. Cotinus obovatus, commonly called American smokewood or chattamwood, is sometimes grown for restoration purposes in wildlife habitats. Its charcoal gray, scale-like bark becomes a pronounced feature in the winter landscape. ‘Grace’ is a hybrid between Cotinus coggygriaand Cotinus obovatus, and exhibits blue-green foliage and dark pink puffs of “smoke”. The most recently introduced cultivar ‘Golden Spirit’ offers bright golden and lime green foliage. When bruised or cut the stems of ‘Golden Spirit’ exude a delightful fresh lemon-lime scent. 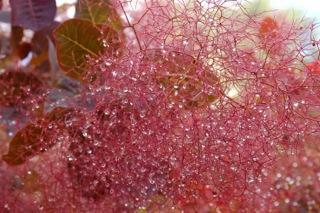 All Cotinus produce a substance that when cut may cause dermatitis.